Welcome to Online Reasoning Test in AffairsCloud.com. We are starting Cumulus Course for SBI Clerk 2018 Prelims Exam and we are creating sample questions in Reasoning section, this type of Question will be asked in SBI Clerk 2018!!! Directions(Q.1 – 5) Study the following information carefully to answer the given queues. Seven boxes –A, B, C, D, E, F & G are kept one above the other, but not necessarily in the same order. Each box contains different Jewellery Items-Chain, Earrings, Bracelet, Ring, Bangle, Necklace & Jhumkas, but not necessarily in the same order. Only three boxes are kept between D & G. The Bangle box is kept immediately above G. Only one box is kept between the Bangle box and A. The Bangle box is not the second from the bottom of the stack. Only one box is kept between E & A. E is kept above A. The Ring box is kept immediately above E. Only three boxes are kept between the Ring box and the Chain Box. The Earrings Box is immediately above the Jhumkas Box. G is not the Earrings box. F is kept immediately below the Necklace box. Only one box is kept between B & the Necklace Box. Four of the following five are alike in a certain way and hence form a group. Which of the following does not belong to the group ? 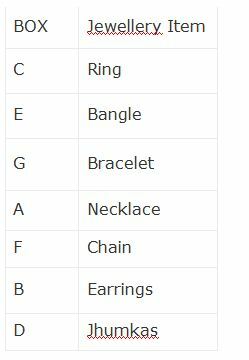 Which of the following boxes contains Bracelet? What is the position of F in the given stack of Boxes ? Which of the following boxes is kept immediately below G? How many boxes are kept between B & the Bangle box? What is the code for ‘rural’ in the given code language? In the given code language, what does the code ‘pt’ stand for? What may be the code for ‘encourage us’ in the given code language? What is the code for ‘to’ in the given code language? If ‘follow on social network’ is coded as ‘dv wz gi’ in the given code language, then what is the code for ‘Tips on social network’?